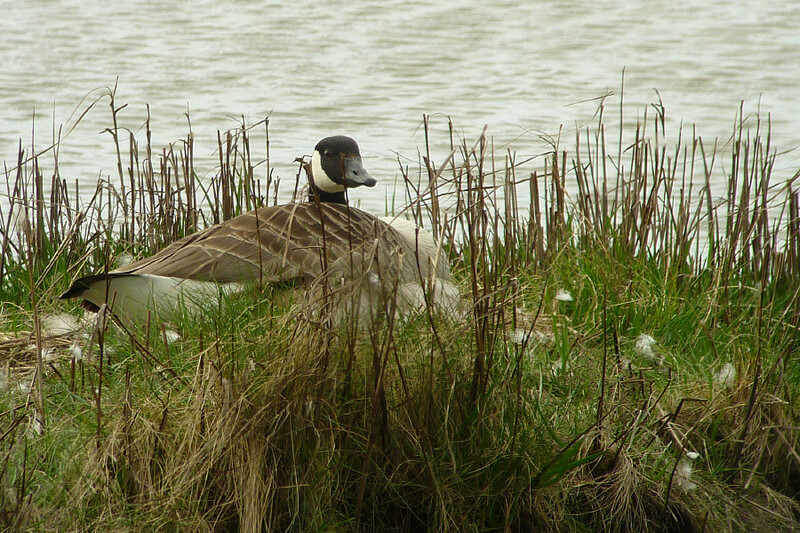 Canada geese are a very recognisable brown goose with their black head and neck and a white throat patch. They are an introduced species and as such are often considered as a pest. They were first brought over from North America in the late 17th century to grace the large lakes of grand houses but they breed well and post war some have escaped. Wildfowlers have also released birds with a view to having another species of wildfowl to shoot. With this assistance they have managed to populate most of Britain except the far north. There are now at least 62,000 breeding pairs according to the RSPB. Their original habitat was the temperate and arctic regions of North America, were they are a very abundant species. In North America there are many races, the three most distinctive races varying in size from Branta canadensis minima (size of a large shelduck) to the largest race Branta Canadensis. Some ornithological authorities now claim these races are distinct species. Flock of Canada geese with one of the small races "minima" . Locally they breed on lakes, ponds and park lakes throughout Cheshire and Lancashire and large numbers breed on the revetment banks of the Manchester Ship Canal, especially between Frodsham and Runcorn, where over 120 nests were counted in 2014. Generally the female is loyal to both her partner and her breeding site and start to breed at about 3 years old. She usually lays a clutch of 5-7 eggs from late March onwards. The 30-day incubation is solely by the female with the male nearby: keeping the site safe from predators. Initially both parents care for the young but when they get larger they join large crèches of young geese tended by a few adults. There is also a large population of non- breeding geese using the estuary, some are probably too young to breed and others unable to find a suitable place to breed. 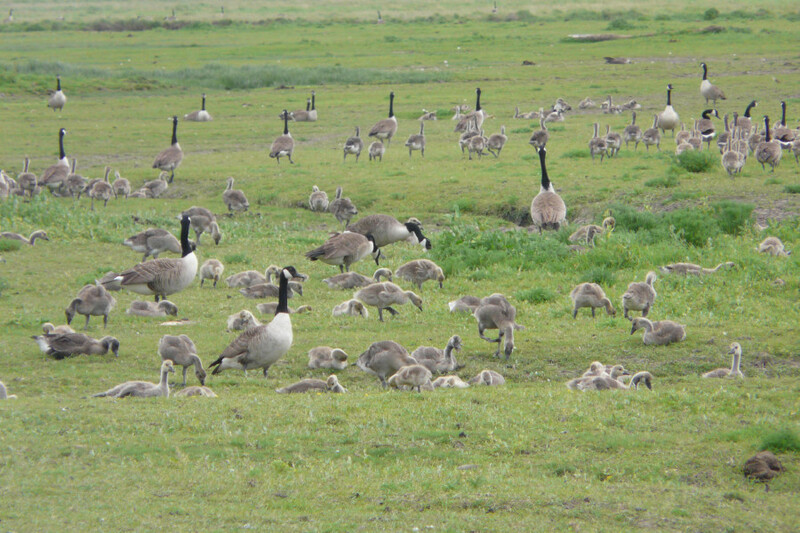 The Canada goose crèche on Hale Marsh. Post breeding the geese head for the Mersey Estuary to moult: being unable to fly for several weeks they need a safe area and find the area of salt marshes between the Manchester Ship Canal and the River Mersey meet their needs. From autumn into winter they tend to spread widely on the marshes and are very mobile: travelling several kilometres to find food. The huge flocks in the autumn glean the spilt grain from the stubble-fields and eat vegetation: mainly roots, grass, leaves and seeds including, unfortunately, the new arable crops that are just showing from the autumn planting. After feeding they use the estuary and local pools to bathe and drink before flighting to the marshes on the estuary to roost at night. Occasionally the geese can be heard calling and moving around at night, especially on a full moon, probably going into the fields to feed. The practise of feeding on newly planted crops in the arable fields has brought them into conflict with the local farmers. Apart from eating the crops the large numbers have ‘puddled’ the agricultural land into mud. Consequently some farmers shoot the geese, put out bird scaring devices or attempt to flush the geese by other means. Unfortunately the disturbed geese just go onto other farmland nearby or back onto the Mersey Estuary, returning to the crop another day. Another further problem, related to farming, is that large numbers of geese on grassland eat large amounts of grass which is intended for cattle. Some wildfowlers also claim that the large number of wigeons Anas penelope which used to be on the Mersey have declined because of the Canada geese flocks grazing and fouling the grass upon which the wigeon fed. 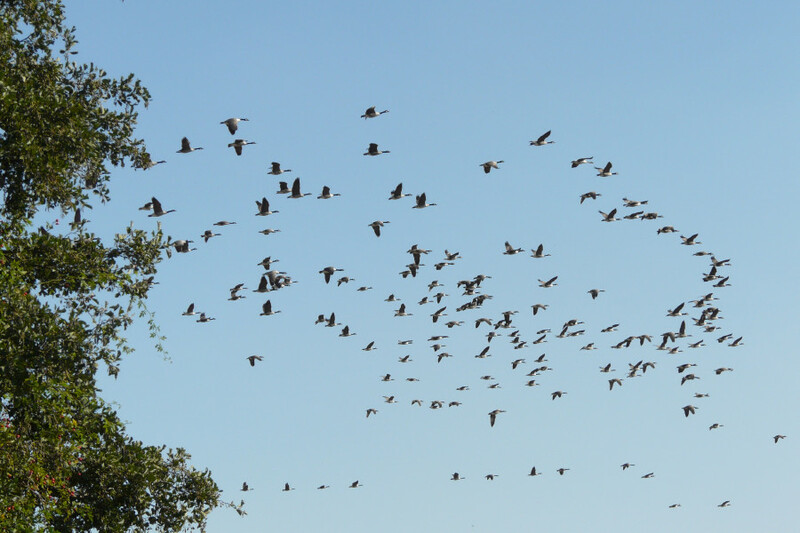 We are informed that wildfowlers are not keen on shooting Canada geese because they are not good to eat, hence there is very little impact on the increasing flocks at present. Some predation of goslings has been observed, in particular by lesser black-backed gulls - a local breeder which is also increasing. Foxes also take some goslings and the occasional adult. Canada geese flying from the arable fields back to Carr Lane Pools. The feeding / roosting area is near to the flight path of Liverpool John Lennon Airport were flying flocks of geese cause anxiety in case of a strike with a plane taking off or landing. Fortunately Canada geese normally fly at very low levels and probably don’t interfere too much with aviation. Usually birdwatchers do not take much notice of the large numbers of Canada geese although the local flocks do attract other geese to land and join them: often on the outer edge of the flock. 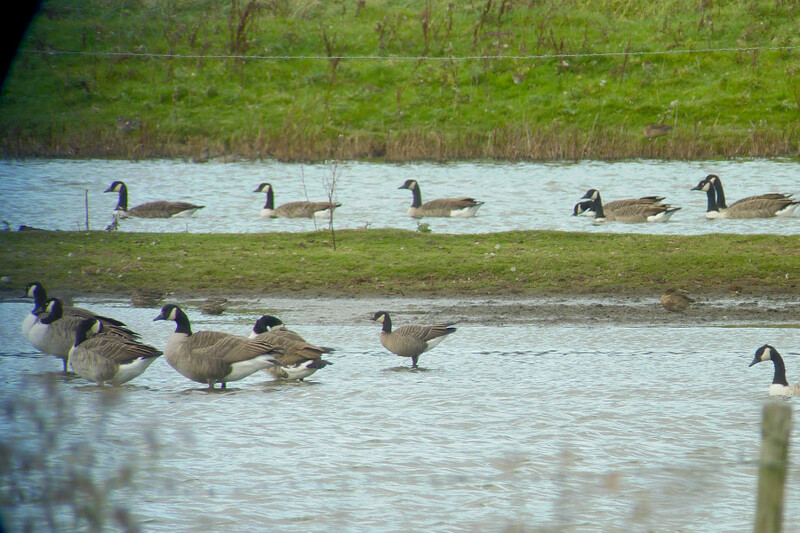 Locally we see many greylags and barnacle geese with the Canadas and whilst some are certainly escapes, like the recent red-breasted goose, others are definitely wild birds. Good examples are the large numbers of pink-footed geese, the five barnacles which had been ringed in Spitzbergen, occasional white-fronted geese of both races and both pale and dark-bellied brent geese which have all be observed in the area in recent years. There are large flocks on the nearby Dee Estuary at various times and there is probably some interchange between the two estuaries: their numbers are low in July and the birds have presumably come to the Mersey to moult. Whilst the general public like to see large flocks flighting about the estuary and many are opposed to shooting the geese it is becoming very apparent that some form of control must be undertaken to keep the numbers at a sensible level in the future. It has generally been believed that the local flock on the Mersey is comprised of Cheshire and Lancashire breeding birds though it is starting to appear, through colour-ringing schemes, that there is lot we do not know about their movements. 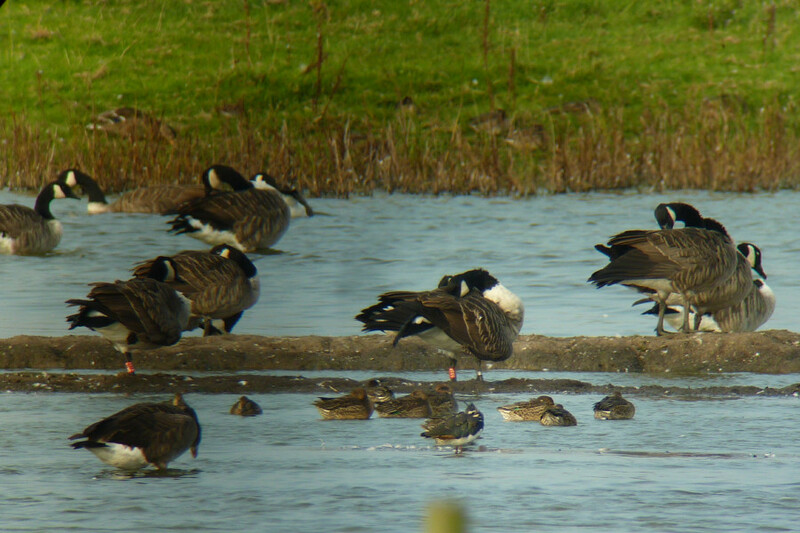 Recently six geese were seen at Carr Lane Pools, Hale with red colour-rings but unfortunately the white lettering could not be deciphered because of the distance involved. Several photographs were taken and we managed to read one ring AAAP . After forwarding the ring number to the scheme involved we have discovered that the bird was ringed on 2nd July 2013 at Bowness-on-Windermere in Cumbria during its annual moult and was seen again on 28th June 2014 at the same site. It was discovered in Hale on 14th September 2014, 115 kilometres from the original site. We understand all these birds were ringed in the same area.